Kevin Elam, one of the founders of this site and a nephew of Karl, brought to my attention the publication of Karl’s Last Interview, conducted by Bradley Sinor, who has become a very prominent horror witer. Even in his final days Karl never looked as ghastly as he appears in this photograph, a happenstance, no doubt, of the poor photocopies of the day. I imagine that applies to Robert Bloch, as well, who also looks rather grim here. Still, they did both die not long after this photo was taken. 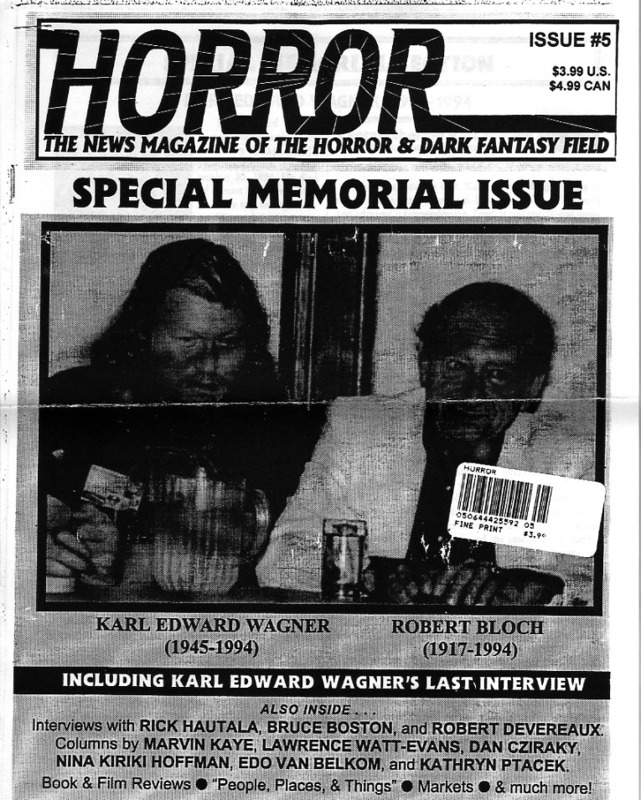 Horror: The News Magazine of the Horror & Dark Fantasy Field is, alas, no longer in print; issue 5 does not appear to be available from any rare book vendor, making this quite a find. Mr. Sinor has kindly permitted me to reprint his interview, which he has taken the trouble of providing me in electronic form. In addition there were moving tributes in this issue. One was by David Niall Wilson, who has also carved his lich – er, niche – in horror, fantasy and sci-fi. His own webpage is under construction. He has kindly granted my permission to post his article here, which I will do (right after I take my state boards, for which I am ill-prepared). I am also trying to secure permisson to reprint articles from this magazine in tribute to Karl on his passing, and to place the actual scans of the original interview and articles online, that last from John Gregory Betancourt, who is now a noted author and editor in fields of the fantastic. In fact, it seems MOST of the alumni of this rare magazine have propered. Except for Karl, of course.